SETI researchers at the Breakthrough Discuss conference, an event hosted by the Breakthrough Initiatives founded by Russian billionaire Yuri Milner, discussed ways to find habitable planets. For exoplanet hunters, distance is the biggest hurdle. The search for life beyond our solar system has turned to analyzing the compositions of alien atmospheres with telescopes at home, which is an incredibly difficult task. It's hard to resolve Pluto from Earth, let alone a small body billions of miles farther away. [Lopez-Morales, staff scientist at the Smithsonian Astrophysical Observatory] proposes looking for oxygen in these atmospheres using a technique called high-resolution spectroscopy, which is essentially collecting high-resolution data of the light passing through a planet's atmosphere. When an exoplanet passes in front of it's parent star, the starlight baths the planet, curving around and through the atmosphere. The problem is that there are no instruments available to perform this type of alien-hunting spectroscopy, especially not for the more distant Earth-sized bodies. "We know that one out of every four small stars should have a planet. Based on those numbers, there's around 250 [stars nearby], so by that count there will be around 60 Earth-like planets within 32 light-years from Earth, " says Lopez-Morales. And while these are close on the cosmic map, detecting oxygen in atmospheres that sit dozens of light-years away is still just too difficult. "There is no telescope that we have today that can do this in a reasonable amount of time," explains Lopez-Morales. "It could take 60 years." 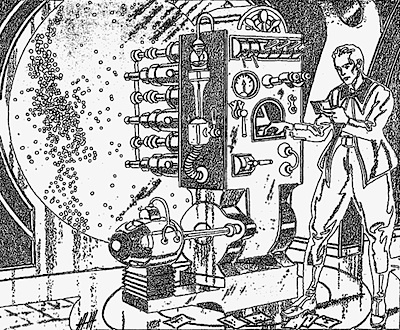 Science fiction legend EE 'Doc" Smith elaborately described a manual search for habitable planets in his 1934 novel Skylark of Valeron, but it's just too slow! I was near enough it now to set my automatic astronomical instruments to searching it for a habitable planet. These instruments were the wonderful ones our astronomers had perfected. With super-telescopic eyes each one scanned a part of the star field before them. And each mechanical eye, when it found planetary systems in its field, automatically shifted upon them a higher powered telespectroscope which recorded on permanent film the size, mean temperature and atmospheric conditions of these worlds.